I thought it was about time we summarised the evidence for those who continue to ask these questions. So why did that Transforming Rehabilitation announcement mean that the Peterborough SIB had to stop? The Peterborough SIB was designed to deliver support into a service gap. Prisoners who serve a sentence of less than 12 months receive no support upon release. Under Transforming Rehabilitation they will. The service gap will no longer exist. The outcomes of Peterborough SIB are measured against a national cohort of similar ex-offenders who receive no government-funded support. The target effect size has been set based on this assumption. If ex-offenders across the nation are receiving new services, then the payment metric is no longer valid. While the results of the Peterborough SIB are measured on the entire cohort released from prison, services are only delivered to those who voluntarily engage with them. This is a key feature of the service delivery model. 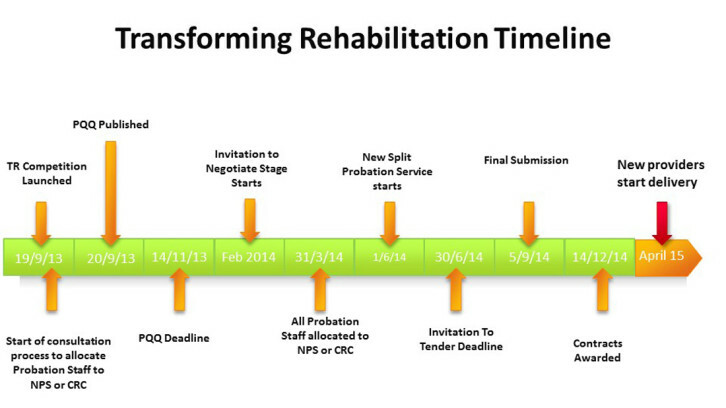 Under Transforming Rehabilitation, engagement with a probation service and the support it offers will be mandatory. If the SIB had continued as it was, it would be breaching the new law. Like most SIB contracts, the Peterborough SIB included clauses that allowed for termination. As with all long-term contracts, it is foreseen that sometimes changes in the policy environment will render the SIB inoperable. This situation is precisely why those clauses were included from the outset. It was desired that Peterborough SIB continued to deliver services for as long as possible, during the development and implementation of the new policy. So while the January 2013 announcement meant that an axe hung over the program, it was not until April 2014 that the decision was announced about when services should cease. There’s no conspiracy. SIBs just aren’t a big enough agenda to hold the entire machinery of government to ransom. The Peterborough SIB was collateral damage of a massive policy reform. Far from being a move to secretly sneak the Peterborough SIB out the back door, this is a public, contentious, and very difficult reform process that rendered many existing contracts redundant, the Peterborough SIB being just one of them. The Peterborough SIB has been providing services to males released from Her Majesty’s Prison Peterborough since August 2010. While the results of the program are based on all prisoners released, their participation in services is voluntary. Cohort: Male prisoners at least 18 years of age at the time of sentencing; sentenced for a consecutive period of less than 365 days; and discharged from HMP Peterborough after serving the sentence referred to above (or any part thereof) at HMP Peterborough. The [HM Secretary of State for Justice] shall have the right at any time during the Contract Period to terminate the Contract by giving 3 Months’ written notice to the [Social Impact Partnership LP (the special purpose vehicle owned by the investors)], provided the date upon which such termination shall take place is expressly stated in such notice (“TC Date“). 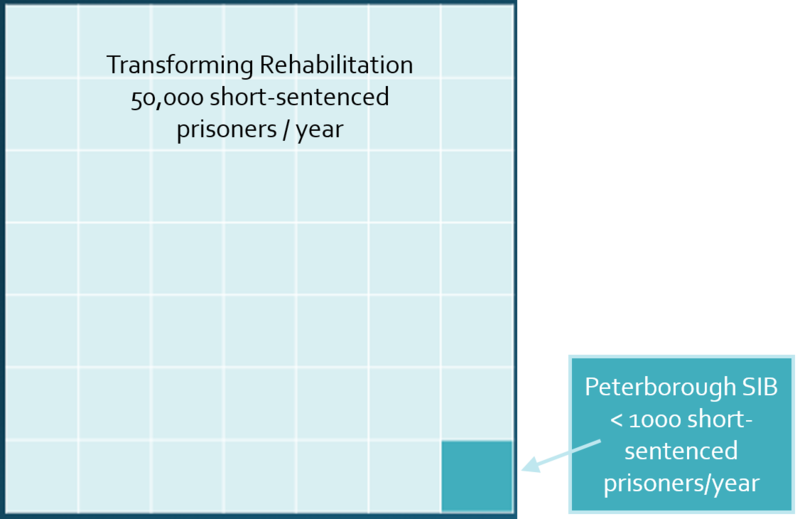 The support to short-sentenced prisoners is a large and lengthy policy agenda of which the Peterborough SIB was only part. The UK Government continues to support and champion the idea of social impact bonds. 18 March 2010 Justice Secretary announcement + press releases from Social Finance Social Finance launches first Social Impact Bond and MoJ Scheme to Reduce Reoffending in Short Term Prisoners Launched. News release 18 March 2010. 9 January 2013 Ministry of Justice press release Transforming Rehabilitation – less crime, fewer victims, safer communities for consultation paper Transforming Rehabilitation: A revolution in the way we manage offenders. “In the December 2010 ‘Breaking the Cycle’ Green Paper, we stated our intention to extend the principles of payment by results to all providers of services for offenders by 2015 and improve the rehabilitation of offenders. This document sets out how we intend to extend payment by results across rehabilitative services in the community. In the March 2012 ‘Punishment and Reform: Effective Probation Services’ consultation, we proposed changes to the way probation services are commissioned and delivered. In this document, we respond to that consultation and set out how our proposals have developed further. 24 April 2014 Social Finance press release. Social Finance Statement (on the removal of outcome payments for the third cohort of the Peterborough SIB). 7 August 2014 Social Finance press release. 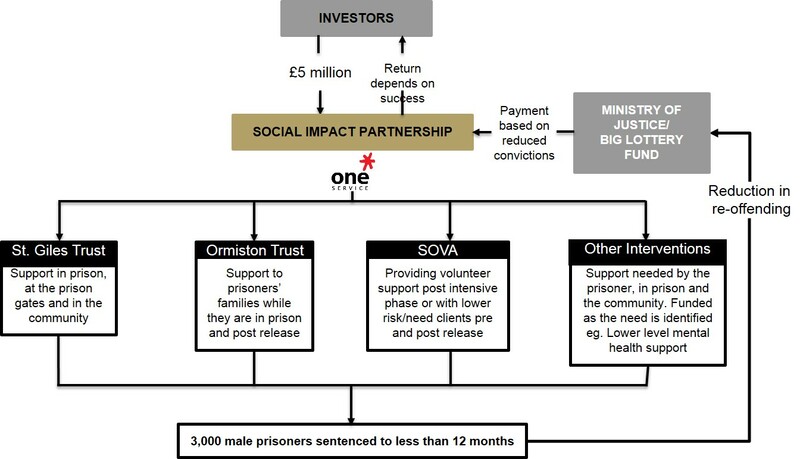 Peterborough Social Impact Bond reduces reoffending by 8.4%, investors on course for payment in 2016. First results announced. No payment triggered by announcement. For further opinion on the apparent success or failure (in response to the announcement not to proceed with the third Peterborough cohort) see Toby Eccles blog, Julian Corner’s article Transforming Rehabilitation is being dressed in sheep’s clothing or David Floyd’s (Social Spider) Beanbags and Bullsh1t blog. OMG Emma. You are a genius! Everyone was asking these questions, and no one knew what to believe. This is a seminal piece. Gracias! This is a good piece. Conspiracy theories around Peterborough SIB are completely overblown. As Emma points out, the SIB couldn’t continue once the counterfactual against which outcomes were measured disappeared thanks to the larger, national reform programme Transforming Rehabilitation. If there is a lesson to be learnt it is: do not design counterfactual measurement baselines for small pilot programmes that depend on an entire national service being kept in aspic. It is not realistic nor wise for taxpayers or service users to postpone reform of national services just to protect a high profile pilot scheme!